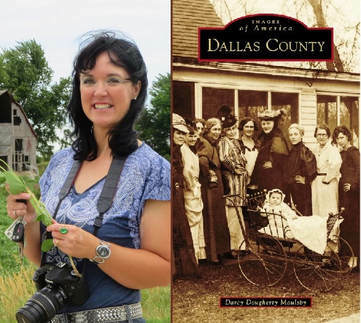 Join us for a fascinating look at Dallas County's history with Darcy Maulsby! Darcy will share stories from her new book about the infamous events and everyday people that made Perry and our county what it is today. This free event will also include guided tours of select hotel rooms by the author and Iowa-themed desserts! No Iowa county has influenced American history more than Dallas County, which has a rich heritage of small-town living, farming, coal mining, and the immigrant experience. Dallas County served as a crossroads for settlers heading west during the California Gold Rush and slaves escaping through the Underground Railroad. In 1933, a shoot-out near Dexfield Park marked the beginning of the end for infamous outlaws Bonnie and Clyde and the notorious Barrow Gang. Dallas County propelled Harry Truman to an unlikely victory in the 1948 presidential campaign. It has produced several major-league baseball players (among them Bob Feller and Hal Manders), a US congressman (David Young), and Nile Kinnick, the 1939 Heisman Trophy winner and University of Iowa football legend whose grandfather George Clarke, of Adel, served as Iowa's governor from 1913 to 1917. This event is sponsored by Hometown Heritage, the Hotel Pattee, and the Perry Public Library and is the first in a series with Maulsby in Fall 2017, which will also include a Night at the Carnegie fundraiser dinner on October 12 and a Trivia Night on November 16. For more details, please contact Alissa with Hometown Heritage at 515-465-7713 or info@fcctrust.org.